The form view panel consists form fields and a line items table and is where the user assigns document data. The form itself can be completely changed from the field designer. In order to fill in a field with data from the current document, the user must click inside the field and then click on the value which they want to populate into that field. 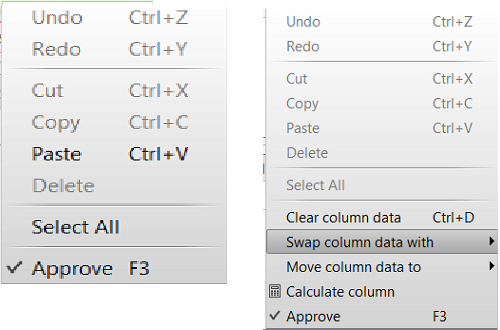 Depending on what kind of field or column is active at the moment the user can use some right click features. The Add to list option appears only for list fields, such as the Vendor field(list fields). It’s important to add entries to the list because the software will include them into its own data base for later use and this also helps with OCRing. The Remove from list option removes the currently populated entry from the list. This option will appear only if the Current ERP is set to CSV. In order to add entries to a field connected to a data base, the user must add those to their own data base first and then to refresh the field contents with the F5 button. Refresh region - Refreshing the region updates its contents in case the OCR did not provide accurate results. If the document quality is low refreshing will not fix faulty values. Approve – Forces the validation for the currently selected field. Works only for fields that have a SoftValidation flag (flags). If users need to extract line item data, they can use the line items capability of the software. In order to fill in a line cell with data from the current document, the user must click inside the cell and then click on the value which they want to populate into that cell. The software offers an automatic auto correct feature, so after the user populates the entire first row, the software will automatically populate the rest after the user assigns the first value from the second row of the table.